I have finally realized something...women do not need any excuse to shop. We just need to. It's like the cravings we get when we are pregnant. Don't know. Don't care. I need my Ben n Jerry ice-cream...NOW! Only now, we get that odd gleam in our eyes when we need our retail fix. Why I am going on and on about our psychological disorder is because, last week, we five women let ourselves loose on a shopping expedition which lasted for exactly 108 hours (believe me...I counted). Now that I am in a much calmer frame of mind, I am now thinking..."was that really me?" It was like we had to do our Pohela Boishakh, Eid, Christmas, Diwali, Hanukkah shopping at one go. You should have seen the camaraderie between the five of us. Friendship reached greater heights this holiday. One instance diary...I was talking on the phone in a busy, crowded mall and was having difficulty hearing from the other side. Suddenly...a nicely filed fingertip arrived helpfully from someone in the group straight into my other ear, just so I could hear properly. Judge that diary! And there I was selfishly thinking...what if the nail was long and pointy? Would it be covered in wax while coming out? And has my eardrum survived the thrust of friendship? Sometimes I feel, I think too much. Anyway diary, for today, I just have one more observation and I am off. Know what diary....now-a-days, us Bangalis, I feel, have learnt to celebrate. I think, even till the late eighties we were sort of hesitant to celebrate anything with great gusto. But, since the nineties till today, even celebrations, which are popular in the West, are gaining momentum in Bangladesh. Like, Valentines Day, Mother's day, Friendship Day, are very much here to stay. But, what really has put a smile on my face is the festive look in the city with Pohela Boishakh just around the corner. It is feeling like a mini Eid. The red and white combination everywhere with motifs of flowers and nature is really a treat for sore eyes and tired minds. Not too good in economics here...but "apparently" all this celebration and celebratory buying and spending is a good sign of the country's economy. So, diary, here are a few of my Boishakhi recipes today, which I am going to make for my Boishakhi lunch. Sorry to leave in a rush diary. What to do? Have to rush to the tailors to make my Boishakhi finery. So, have a great day the Sam Q way! Mix all ingredients except eggs, sesame seeds & oil. Add 1 tbsp of oil to the mix and marinate for at least one hour. Whisk eggs with a little salt. Coat the fillets with beaten eggs and roll in a bed of sesame seeds. Heat oil and deep fry the fillets. Place on kitchen towels to drain excess oil. Serve hot. Pre-heat oven to 200 C/gas 6. Place the potatoes into a large roasting tin and toss with oil. Roast for 30 mins, turning occasionally. Add the cumin and mustard seeds, turmeric, garam masala and salt to the potatoes. Stir until they are well coated with the spices and roast for further 10 mins. Meanwhile, whisk the yoghurt and red chilli powder and little salt and pour into a small serving bowl. Place the spiced potatoes onto a serving plate and scatter with the sliced chilli. Serve with the yoghurt. Peel & de-vein prawns chop. Heat oil. Put onion, garlic, ginger and fresh green chilli and fry. Now add vinegar, turmeric, ground black pepper, jeera and red chilli paste. Keep on stirring till oil separates from the paste. Add prawns and salt to taste. After prawns are cooked, pour lemon juice and serve hot. 1 tsp red chilli paste, turmeric, black pepper & jeera powder. 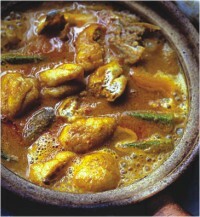 Combine the coconut milk, curry paste, shredded lime leaves, chilli fish sauce, molasses and lime juice in a bowl. Lay four 30 cm x 30 cm pieces of foil on table. Place a fish fillet in the centre of each. Alternatively you can use banana leaves to wrap the fish. Spoon the coconut milk mixture over the fillets. Fold paper to enclose the fish and tie with string. Then bake in a pre-heated oven for 10-15 mins or till cooked. Serve with steamed rice and lime halves.